Education and working with young people has been at the core of Berakah’s work since the very beginning. In fact, it was due to our founders work in disadvantaged people involved in music workshops held by The Princes Trust that the idea for Berakah first occurred to him. To read more about his work with The Princes Trust and the genesis of Berakah click here. 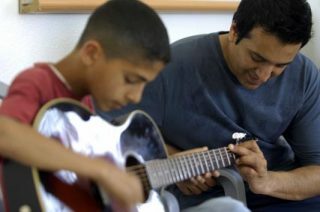 We’ve held music workshops both in London and places as far away as Leeds and Wiltshire and Mohammed Nazam has been involved in three trips to Israel/Palestine to work on music project there, bringing together children and young adults from both sides of the divide. Education, reaching deep into our communities and bringing the message of Berakah to future generations is central to our very ethos. Currently we are working on a number of projects that include young people including our new band for young musicians, Increase The Peace. We’re also working on projects for young people that work in the written word, photography and other arts so as to include even more people in our work. We are very keen to make links to people in education so that we can fully maximise the potential for Berakah to positively influence the young people of the UK. If you’d like to read about our past work with some very young people please click here and if you work in education or with young people and would like to talk to us about organising a project please get in touch via the contact pages.